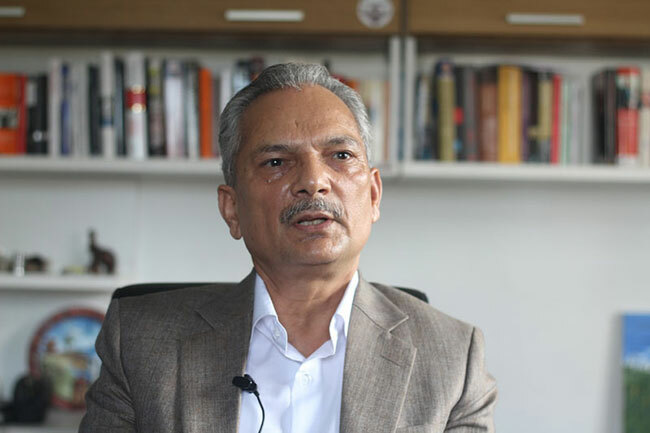 Few other leaders in Nepal’s political history have consistently garnered as much criticism from across the left-right political spectrum than former Prime Minister and Naya Shakti Party Coordinator Baburam Bhattarai. The Right sees him as this ‘Dr. Evil’ who masterminded the murderous Maoist insurgency. The Left calls him all sorts of things, from a ‘revisionist’ to a ‘RAW agent’. Public opinion, especially in past few years, has also turned increasingly hostile, with a large majority highly critical of him and only a small fringe, mostly comprised of intellectuals and indigenous activists, supporting him. Bhattarai’s recent flirtation and eventual departure from the left coalition has only added to the public fury. But despite being perhaps the most controversial politician of our generation, I feel the country at this juncture needs him more than ever. I wanted to start my defense of Bhattarai by citing his works during his premiership. But I now find it unnecessary because those things are out in the open and for those who claim to not see, no amount of persuasion can convince them. As the saying goes, “you can wake a person who is sleeping but you can never wake a person who acts as if he is sleeping”. Hence, as a Marxist, just like Bhattarai, most of my defense will be centered on his political ideology and vision. First, I feel no discussion on contemporary politics can be free of the so-called Left-Democratic polarization. Anyone in the right frame of mind can tell that such collations are largely based on petty politics and have little to do with ideology. But they need to be discussed nonetheless. After all, much of the scorn towards Bhattarai derives from his departure from the left camp. UML and Maoist Center have forged an electoral alliance, with the possibility of merger, in order to take the country on the path of socialism. But even if they win the two-thirds supermajority, they have absolutely no interest and certainly no wish to implement even basic socialist tenets like progressive taxation and inheritance tax, let alone ‘glorious’ projects of nationalization. The muscles these parties flex are powered by the money of private education and medical mafias; of the industrialists who have gained prosperity by dodging taxes and use patronage to make the most of our crony capitalist system; and of the “real estate brokers”. Any progressive policy to reform the economy and better distribute wealth or make society more equitable will be against the interest of these moneymen. Hence there is huge doubt that anything good will accrue to the common man from the future UML-Maoist regime. But Bhattarai has always talked about building an egalitarian society by balancing the public and the private sectors. For example he once even floated the idea of having a two-tier education system, where the state will enforce a public education system until secondary level and the private sector would be allowed to open education institutions from higher secondary level onwards. But despite this Bhattarai has always been labeled as this anti-socialist elitist, while most of the so-called “communist” leaders whose inner circle consists of private school owners are portrayed as the messiahs of the Nepali working class. This is just one example. The country is full of such Orwellian hypocrisies on part of the left leaders. Another reason why the country needs Bhattarai is because he carries aspirations of indigenous nationalities, Madhesis, and other marginalized communities. If you scroll his Facebook page and look at the comments, this fact will seem evident. Most of the support and praise he gets in his Facebook posts is from people of these communities. It is mainly because Bhattarai has always supported different rights-based movements with the view that development can never be possible without the mobilization of these marginalized communities—in a country where they make up three-quarters of the total population. It is true that the Maoists historically carried the same aspiration, but with its possible merger with UML, a party that isn’t particularly keen on rights of Madhesis and indigenous nationalities, these communities can easily be alienated from mainstream nation-building process. This in turn can lead to another conflict. Hence it is imperative that Bhattarai remains in mainstream politics to address the demands of the oppressed nationalities. As Bhattarai gears up to face his leftist opposition, he will be called a lot of names, most of which will revolve around him abandoning the Maoist party and more recently the left coalition, and allegedly even his socialist and Marxist ideologies. But for me, he is head and shoulders above other leaders when it comes to understanding and implementing Marxism. His Marxism is a cumulative conclusion of socialist traditions and Marxist thinking that started with the French Revolution and continued with the teachings of Lenin, Rosa Luxemburg, Antonio Gramsci, and Theodor Adorno, to the experiences of the Latin American socialists like Hugo Chavez and Evo Morales. It is also the acknowledgement that what happened in the east of the Berlin wall during the 20th century cannot be repeated in the name of socialism. It is a critical appreciation of capitalism for its ability to boost growth and innovation; even Marx deemed capitalism to be highly productive and important to do away with the ancien régime. For a country characterized by underdevelopment and backwardness and still carrying feudal burdens and bondages like deep social stratifications and racial and cultural discriminations, capitalism can act as a liberator and a force that levels the playing field to an extent. But the capitalism talked about here is not the crony capitalism of present times or the American Wild West brand of neoliberal capitalism. This one is well-regulated with state laws and progressive taxation; a system where there is some sort of market economy but it is checked and balanced by strong social welfare system and utmost social security is provided to the working people. Bhattarai’s socialism is the understanding that some sort of “capitalism” has to be adopted, albeit reluctantly, owing to its historical necessity for growth and development. But the interest of the working class and common Nepali people should always be prioritized above that of the bourgeoisie. This is the most feasible form of governance at the moment, and the country needs Bhattarai to take up the role of an “architect” to give this idea concrete shape. True, he is not free from his share of weaknesses and shortcomings. The first thing Bhattarai has to do is get back to his socialist and Marxist roots. His appeasing of the urban middle class, who in return loathe him, will only further alienate his main supporters who are people of the working class and marginalized communities. He should also be more articulate of his ideas and values because only few people who have a substantial grasp of world history, politics, and economy, understand his thoughts and vision for the country. He should make his language more layman-oriented. But despite his share of criticism, he is perhaps one of the very few people who can guide the country towards a more democratic, inclusive and egalitarian future, as mandated by our constitution.